Hillary Clinton MrsSatan had a huge win in West Virginia, receiving over twice the amount of votes than The Obamalith. She will - and she should - take her candidacy all the way to the convention. Why should she quit? The Obamaniacs want her to get out for no reason other than to make it easier on the presumptive Anointed One, the half-black and half-white Candidate Bele from Illinois. Every vote counts? Not if you're an Obamaniac. Not if you're a voter in Michigan and Florida. Not if you don't blindly support The Muslim Candidate. 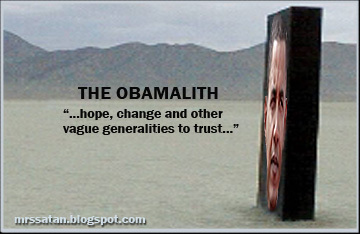 Recall The Obamalith, a month or so ago, when he said why can't this all be over? The "this" he was referring to is the Democrat Primary. I guess The Obamalith wants to be selected instead of elected. Ted Kennedy's Poodle thinks it is beneath him to have to go through the primary process battle; he's "above" it; he thinks he's entitled to the coronation without the battle scars. Typical, typical Liberal. The popular vote in the Democrat primary doesn't matter, it is irrelevant and delegates and Superdelegates can switch for whom they are supporting. But the Obamaniacs don't want the voice of the Democrat people represented - oh, no - they want to control the primary, kicking Hillary out and select rather than elect the Dem candidate. And of course, they want it to be The Muslim From Illinois. And boy, the vicious and nasty attacks from the Left on the people of West Virginia. Whoa, according to some on Liberal Talk Radio - The Rapidly Decaying Corpse of Mike Malloy and Fat, Dumb wife-beating Ed Schultz to name two - the people in West Virginia are just a bunch of inbred, one-tooth, gun-toting, squirrel eating, moonshine-drinking hillbilly racists. This must be what the Democrats mean by their language of "healing and uniting" the country. 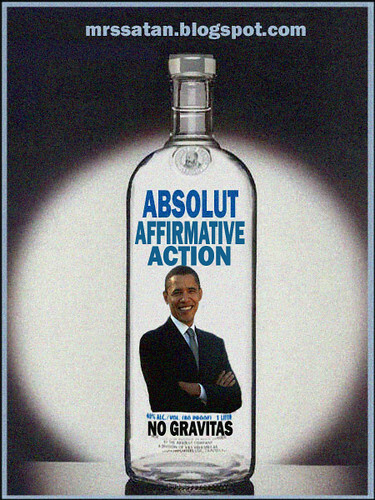 It is clear that the Dems don't want to abide by any primary process, they only want to crown The Obamalith as their candidate and then magically put him in the White House without the November election taking place. Well Dems, as the old saying goes, wish in one hand and piss in the other and see which hand gets filled up first. The results of primaries in Florida and Michigan should matter because MrsSatan and The Poodle are so close. But Michigan and Florida voters are disenfranchised by the political party that claims every vote counts and that they'd never disenfranchise their voting base, but this is exactly what they have done. Such sweet, sweet irony. The Obamaniacs are livid that West Virginia voters didn't hand Ted Kennedy's Poodle a win. Another stunning, but not surprising, example of Liberals and Progressives demonstrating divisiveness and hatred toward people who don't think exactly as they do. 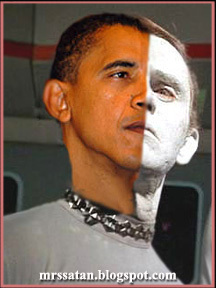 In the minds of the Obamaniacs, if you don't fully support him, you are the enemy. Again, such sweet, sweet irony. Liberal Radio Talker Thommmmmmmm Hartmannnnnnnnnnn - the biggest Lefty Liar since Al Franken - on his Wednesday program called the West Virginia voters "white racists" at the outset of his show. Oh yeah, the Dems are all about healing and uniting. It's nice to see the Dems finally admitting that their party is full of racists. Why, U.S. Democrat Senator from West Virginia Robert "KKK The Klansman" Byrd wins re-election from those "white racists" term after term. Who am I to argue with these fine and intelligent Democrat pundits and politicians when they call their own party a bunch of racists. For once, the Dems are spot on recognizing what everyone else has known for a long, long time. What took 'ya so long, Dems? Is the truth that hard to admit? You bet it is.